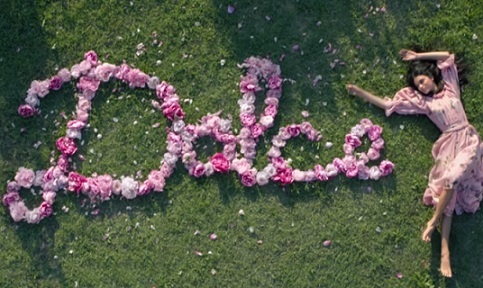 Dolce & Gabbana advertises the new Dolce Peony fragrance for women in a new commercial. The 35-second spot features a young brunette woman clad in a gorgeous peony-print dress sneaking into a beautiful peony garden, rolling in the petals and dancing in swirls of colourful blooms. The soundtrack music is the 2017 single “Lazy” by LA-based French singer Marie Monti. Described as “Fresh, free and deliciously feminine,” the Dolce Peony Eau de Parfum marks the addition of a new flower in the Dolce fragrance family. The scent, featuring top notes of pink pepper, white bergamot, nashi pear, cyclamen petals, heart notes of peony, Bulgarian rose and freesia flowers, and base notes of yellow plum nectar, amber and patchouli, comes in a purple flacon with a floral purple cap, adorned with a black grosgrain bow. The name is written in deep raspberry pink, a nod to the peony’s spectrum of shades, which ranges from sheerest lilacs to the punchiest reds. The Dolce collection, launched in 2014, debuted with the first Dolce edition, which was followed by Dolce Floral Drops in 2015, Dolce Rosa Excelsa in 2016 and Dolce Garden in 2018.